Improvement at croquet, as at most things, is not a steady upward climb. Sometimes things seem to come together and improvement happens quickly. At other times you get stuck on a plateau. This is natural, and often you are improving more than you realize, even when you seem to be holding steady or backsliding. But sometimes players get genuinely stuck in their development. Improvement is never a given, even with lots of practice. If you really are on a plateau, you aren’t going to resume your climb until you identify the things that are holding you back. I often hear, “I know what to do, I just can’t execute the shots.” But players who say this often have it backwards: it is their tactics that hold them back. Such players are unlikely to advance unless they change their thinking. For one thing, they are probably defining tactics too narrowly. I deliberately use the term “tactics” rather than the more commonly heard (in the USA) “strategy”. Strategy implies large-scale thinking across a series of turns: openings and end-games, knowing when to attack and when to defend. This is what most players mean by strategy. But smaller-scale planning, especially the sequencing and positioning of shots within a turn, is just as important if not more so. I use the term tactics to cover all of these types of planning. 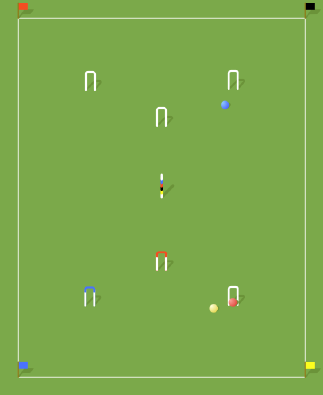 For American-rules croquet I divide players into three ability groups. At the higher-handicap level are the players who rarely if ever attempt three- and four-ball breaks. Above this are players who do make breaks, but whose play is unpredictable enough that going three-ball dead to set partner is not usually a good bet. At the top are players who have a fair chance of making an all-round three-ball break, and hence who should be looking to attack. I see the same types of tactical mistakes at each of these levels. The biggest problems are: putting defense ahead of offense; failing to see three- and four-ball break opportunities, and; poor break management. The first two of these share the same underlying cause: failure to give top priority to three- and four-ball breaks. Tactics become much clearer once you do this. The first question you ask in any situation is: is there a reasonable opportunity for an immediate four-ball break? If not, is there an immediate three-ball break? If the answer to either question is yes, that’s all you need to know. This is true even for many players who primarily play two-ball croquet, because many such players have the skills needed for four-ball breaks, and even three-ball breaks in the right situation. In Diagram 1, your opponent was making a four-ball break with red, and has failed at 3-back. Black was nearby and you have just roqueted yellow and are ball in hand on it. Red is three-ball dead and is dead center in the jaws of 3-back, so that you can easily rush it either way. All other other balls are clean and for #2. What are you going to do, and why? (The situation comes from an actual championship-flight game at a recent tournament.) Answers in a future installment.